Hyaluronic acid (HA; conjugate base hyaluronate), also called hyaluronan, is an anionic, nonsulfated glycosaminoglycan distributed widely throughout connective, epithelial, and neural tissues. It is unique among glycosaminoglycans in that it is nonsulfated, forms in the plasma membrane instead of the Golgi apparatus, and can be very large, with its molecular weight often reaching the millions. One of the chief components of the extracellular matrix, hyaluronan contributes significantly to cell proliferation and migration, and may also be involved in the progression of some malignant tumors. Until the late 1970s, hyaluronic acid was described as a "goo" molecule, a ubiquitous carbohydrate polymer that is part of the extracellular matrix. For example, hyaluronic acid is a major component of the synovial fluid, and was found to increase the viscosity of the fluid. Along with lubricin, it is one of the fluid's main lubricating components. Hyaluronic acid is an important component of articular cartilage, where it is present as a coat around each cell (chondrocyte). When aggrecan monomers bind to hyaluronan in the presence of HAPLN1 (Hyaluronanic acid and proteoglycan link protein 1), large, highly negatively charged aggregates form. These aggregates imbibe water and are responsible for the resilience of cartilage (its resistance to compression). The molecular weight (size) of hyaluronan in cartilage decreases with age, but the amount increases. A lubricating role of hyaluronan in muscular connective tissues to enhance the sliding between adjacent tissue layers has been suggested. A particular type of fibroblasts, embedded in dense fascial tissues, has been proposed as being cells specialized for the biosynthesis of the hyaluronan-rich matrix. Their related activity could be involved in regulating the sliding ability between adjacent muscular connective tissues. Hyaluronanic acid is also a major component of skin, where it is involved in tissue repair. When skin is exposed to excessive UVB rays, it becomes inflamed (sunburn) and the cells in the dermis stop producing as much hyaluronan, and increase the rate of its degradation. Hyaluronan degradation products then accumulate in the skin after UV exposure. While it is abundant in extracellular matrices, hyaluronan also contributes to tissue hydrodynamics, movement and proliferation of cells, and participates in a number of cell surface receptor interactions, notably those including its primary receptors, CD44 and RHAMM. Upregulation of CD44 itself is widely accepted as a marker of cell activation in lymphocytes. Hyaluronan's contribution to tumor growth may be due to its interaction with CD44. Receptor CD44 participates in cell adhesion interactions required by tumor cells. Although hyaluronan binds to receptor CD44, there is evidence hyaluronan degradation products transduce their inflammatory signal through toll-like receptor 2 (TLR2), TLR4, or both TLR2 and TLR4 in macrophages and dendritic cells. TLR and hyaluronan play a role in innate immunity. There are limitations including the in vivo loss of this compound limiting the duration of effect. In some cancers, hyaluronic acid levels correlate well with malignancy and poor prognosis. Hyaluronic acid is, thus, often used as a tumor marker for prostate and breast cancer. It may also be used to monitor the progression of the disease. As shown in Figure 1, the various types of molecules that interact with hyaluronan can contribute to many of the stages of cancer metastasis, i.e. further the spread of cancer. Hyaluronic acid synthases (HAS) play roles in all of the stages of cancer metastasis. By producing anti-adhesive HA, HAS can allow tumor cells to release from the primary tumor mass, and if HA associates with receptors such as CD44, the activation of Rho GTPases can promote epithelial-mesenchymal transition (EMT) of the cancer cells. During the processes of intravasation or extravasation, the interaction of HAS produced HA with receptors such as CD44 or RHAMM promote the cell changes that allow for the cancer cells to infiltrate the vascular or lymphatic systems. While traveling in these systems, HA produced by HAS protects the cancer cell from physical damage. 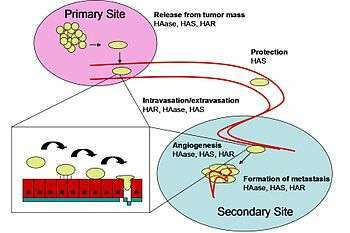 Finally, in the formation of a metastatic lesion, HAS produces HA to allow the cancer cell to interact with native cells at the secondary site and to produce a tumor for itself. HA fragments promote angiogenesis and hyaluronidases produce these fragments. hypoxia also increases production of HA and activity of hyaluronidases. The hyaluronic acid receptors, CD44 and RHAMM, are most thoroughly studied in terms of their roles in cancer metastasis. Increased clinical CD44 expression has been positively correlated to metastasis in a number of tumor types. In terms of mechanics, CD44 affects adhesion of cancer cells to each other and to endothelial cells, rearranges the cytoskeleton through the Rho GTPases, and increases the activity of ECM degrading enzymes. Increased RHAMM expression has also been clinically correlated with cancer metastasis. In terms of mechanics, RHAMM promotes cancer cell motility through a number of pathways including focal adhesion kinase (FAK), Map kinase (MAPK), pp60(c-src), and the downstream targets of Rho kinase (ROK). RHAMM can also cooperate with CD44 to promote angiogenesis toward the metastatic lesion. Skin provides a mechanical barrier to the external environment and acts to prevent the ingress of infectious agents. Once injured, the tissues beneath are exposed to infection; therefore, rapid and effective healing is of crucial significance to reconstruct a barrier function. Skin wound healing is a complex process, and includes many interacting processes initiated by haemostasis and the release of platelet-derived factors. The following stages are inflammation, granulation tissue formation, reepithelization and remodeling. HA is likely to play a multifaceted role in mediation of these cellular and matrix events. The proposed roles of HA in this sequence of skin wound healing events are detailed below. Hyaluronic acid has also been used in the synthesis of biological scaffolds for wound-healing applications. These scaffolds typically have proteins such as fibronectin attached to the hyaluronan to facilitate cell migration into the wound. This is particularly important for individuals with diabetes suffering from chronic wounds. In the early inflammatory phase of wound repair, wounded tissue is abundant in HA, probably a reflection of increased synthesis. HA acts as a promoter of early inflammation, which is crucial in the whole skin wound-healing process. In a murine air pouch model of carrageenan/IL-1-induced inflammation, HA was observed to enhance cellular infiltration. showed a dose-dependent increase of the proinflammatory cytokines TNF-α and IL-8 production by human uterine fibroblasts at HA concentrations of 10 μg/mL to 1 mg/mL via a CD44-mediated mechanism. Endothelial cells, in response to inflammatory cytokines such as TNF-α, and bacterial lipopolysaccharide, also synthesize HA, which has been shown to facilitate primary adhesion of cytokine-activated lymphocytes expressing the HA-binding variants of CD44 under laminar and static flow conditions. It is interesting to note that HA has contradictory dual functions in the inflammatory process. It not only can promote the inflammation, as stated above, but also can moderate the inflammatory response, which may contribute to the stabilization of granulation tissue matrix, as described in the following part. In addition to the free-radical scavenging role, HA may also function in the negative feedback loop of inflammatory activation through its specific biological interactions with the biological constituents of inflammation. TNF-α, an important cytokine generated in inflammation, stimulates the expression of TSG-6 (TNF-stimulated gene 6) in fibroblasts and inflammatory cells. TSG-6, a HA-binding protein, also forms a stable complex with the serum proteinase inhibitor IαI (Inter-α-inhibitor) with a synergistic effect on the latter’s plasmin-inhibitory activity. Plasmin is involved in activation of the proteolytic cascade of matrix metalloproteinases and other proteinases leading to inflammatory tissue damage. Therefore, the action of TSG-6/ IαI complex, which may be additionally organized by binding to HA in the extracellular matrix, may serve as a potent negative feedback loop to moderate inflammation and stabilize the granulation tissue as healing progresses. In the murine air pouch model of carragenan/IL-1 (Interleukin-1β)-induced inflammation, where HA has been shown to have a proinflammatory property, reduction of inflammation can be achieved by administrating TSG-6, and the result is comparable with systemic dexamethasone treatment. Granulation tissue is the perfused, fibrous connective tissue that replaces a fibrin clot in healing wounds. It typically grows from the base of a wound and is able to fill wounds of almost any size it heals. HA is abundant in granulation tissue matrix. A variety of cell functions that are essential for tissue repair may attribute to this HA-rich network. These functions include facilitation of cell migration into the provisional wound matrix, cell proliferation and organization of the granulation tissue matrix. Initiation of inflammation is crucial for the formation of granulation tissue, therefore the pro-inflammatory role of HA as discussed above also contributes to this stage of wound healing. Cell migration is essential for the formation of granulation tissue. The early stage of granulation tissue is dominated by a HA-rich extracellular matrix, which is regarded as a conducive environment for migration of cells into this temporary wound matrix. Contributions of HA to cell migration may attribute to its physicochemical properties as stated above, as well as its direct interactions with cells. For the former scenario, HA provides an open hydrated matrix that facilitates cell migration, whereas, in the latter scenario, directed migration and control of the cell locomotory mechanisms are mediated via the specific cell interaction between HA and cell surface HA receptors. As discussed before, the three principal cell surface receptors for HA are CD44, RHAMM, and ICAM-1. RHAMM is more related to cell migration. It forms links with several protein kinases associated with cell locomotion, for example, extracellular signal-regulated protein kinase (ERK), p125fak, and pp60c-src. During fetal development, the migration path through which neural crest cells migrate is rich in HA. HA is closely associated with the cell migration process in granulation tissue matrix, and studies show that cell movement can be inhibited, at least partially, by HA degradation or blocking HA receptor occupancy. By providing the dynamic force to the cell, HA synthesis has also been shown to associate with cell migration. Basically, HA is synthesized at the plasma membrane and released directly into the extracellular environment. This may contribute to the hydrated microenvironment at sites of synthesis, and is essential for cell migration by facilitating cell detachment. In normal skin, HA is found in relative high concentrations in the basal layer of the epidermis where proliferating keratinocytes are found. CD44 is collocated with HA in the basal layer of epidermis where additionally it has been shown to be preferentially expressed on plasma membrane facing the HA-rich matrix pouches. Maintaining the extracellular space and providing an open, as well as hydrated, structure for the passage of nutrients are the main functions of HA in epidermis. A report found HA content increases at the presence of retinoic acid (vitamin A). The proposed effects of retinoic acid against skin photo-damage and aging may be correlated, at least in part, with an increase of skin HA content, giving rise to increase of tissue hydration. It has been suggested the free-radical scavenging property of HA contributes to protection against solar radiation, supporting the role of CD44 acting as a HA receptor in the epidermis. Epidermal HA also functions as a manipulator in the process of keratinocyte proliferation, which is essential in normal epidermal function, as well as during reepithelization in tissue repair. In the wound healing process, HA is expressed in the wound margin, in the connective tissue matrix, and collocating with CD44 expression in migrating keratinocytes. Kaya et al. found suppression of CD44 expression by an epidermis-specific antisense transgene resulted in animals with defective HA accumulation in the superficial dermis, accompanied by distinct morphologic alterations of basal keratinocytes and defective keratinocyte proliferation in response to mitogen and growth factors. Decrease in skin elasticity, impaired local inflammatory response, and impaired tissue repair were also observed. Their observations are strongly supportive of the important roles HA and CD44 have in skin physiology and tissue repair. Lack of fibrous scarring is the primary feature of fetal wound healing. Even for longer periods, HA content in fetal wounds is still higher than that in adult wounds, which suggests that HA may, at least in part, reduce collagen deposition and therefore lead to reduced scarring. This suggestion is in agreement with the research of West et al., who showed in adult and late gestation fetal wound healing, removal of HA results in fibrotic scarring. Hyaluronic acid has been used in attempts to treat osteoarthritis of the knee via injecting it into the joint. It has not been proven, however, to generate significant benefit and has potentially severe adverse effects. Dry, scaly skin such as that caused by atopic dermatitis may be treated with skin lotion containing sodium hyaluronate as its active ingredient. Hyaluronic acid has been used in various formulations to create artificial tears to treat dry eye. Hyaluronic acid is a common ingredient in skin-care products. Hyaluronic acid is used as a dermal filler in cosmetic surgery. It is typically injected using either a classic sharp hypodermic needle or a cannula. Complications include the severing of nerves and vessels, pain and bruising. In some cases hyaluronic acid fillers result in a granulomatous foreign body reaction. Properties of hyaluronic acid were first determined in the 1930s in the laboratory of Karl Meyer. Hyaluronic acid is a polymer of disaccharides, themselves composed of D-glucuronic acid and N-acetyl-D-glucosamine, linked via alternating β-(1→4) and β-(1→3) glycosidic bonds. Hyaluronic acid can be 25,000 disaccharide repeats in length. Polymers of hyaluronic acid can range in size from 5,000 to 20,000,000 Da in vivo. The average molecular weight in human synovial fluid is 3–4 million Da, and hyaluronic acid purified from human umbilical cord is 3,140,000 Da. Hyaluronic acid also contains Silicon, ranging between 350μg/g to 1900μg/g depending on location in the organism. Hyaluronic acid is energetically stable, in part because of the stereochemistry of its component disaccharides. Bulky groups on each sugar molecule are in sterically favored positions, whereas the smaller hydrogens assume the less-favorable axial positions. Hyaluronic acid is synthesized by a class of integral membrane proteins called hyaluronan synthases, of which vertebrates have three types: HAS1, HAS2, and HAS3. These enzymes lengthen hyaluronan by repeatedly adding glucuronic acid and N-acetylglucosamine to the nascent polysaccharide as it is extruded via ABC-transporter through the cell membrane into the extracellular space. Hyaluronic acid synthesis has been shown to be inhibited by 4-methylumbelliferone (hymecromone, heparvit), a 7-hydroxy-4-methylcoumarin derivative. This selective inhibition (without inhibiting other glycosaminoglycans) may prove useful in preventing metastasis of malignant tumor cells. There is feedback inhibition of hyaluronan synthesis by low molecular weight hyaluronan (<500kDa) at high concentrations but stimulation by high molecular weight (>500kDa) HA when tested in cultured human synovial fibroblasts. Bacillus subtilis recently has been genetically modified to culture a proprietary formula to yield hyaluronans, in a patented process producing human-grade product. So far, cell receptors that have been identified for HA fall into three main groups: CD44, Receptor for HA-mediated motility (RHAMM) and intercellular adhesion molecule-1 (ICAM-1). CD44 and ICAM-1 were already known as cell adhesion molecules with other recognized ligands before their HA binding was discovered. CD44 is widely distributed throughout the body, and the formal demonstration of HA-CD44 binding was proposed by Aruffo et al. in 1990. To date, it is recognized as the main cell surface receptor for HA. CD44 mediates cell interaction with HA and the binding of the two functions as an important part in various physiologic events, such as cell aggregation, migration, proliferation and activation; cell–cell and cell–substrate adhesion; endocytosis of HA, which leads to HA catabolism in macrophages; and assembly of pericellular matrices from HA and proteoglycan. Two significant roles of CD44 in skin were proposed. The first is regulation of keratinocyte proliferation in response to extracellular stimuli, and the second is the maintenance of local HA homeostasis. ICAM-1 is known mainly as a metabolic cell surface receptor for HA, and this protein may be responsible mainly for the clearance of HA from lymph and blood plasma, which accounts for perhaps most of its whole-body turnover. Ligand binding of this receptor, thus, triggers a highly coordinated cascade of events that includes the formation of an endocytotic vesicle, its fusion with primary lysosomes, enzymatic digestion to monosaccharides, active transmembrane transport of these sugars to cell sap, phosphorylation of GlcNAc and enzymatic deacetylation. Like its name, ICAM-1 may also serve as a cell adhesion molecule, and the binding of HA to ICAM-1 may contribute to the control of ICAM-1-mediated inflammatory activation. Hyaluronic acid is derived from hyalos (Greek for vitreous) and uronic acid because it was first isolated from the vitreous humour and possesses a high uronic acid content. Hyaluronic acid is found in many tissues of the body, such as skin, cartilage, and the vitreous humour. Therefore, it is well suited to biomedical applications targeting these tissues. The first hyaluronan biomedical product, Healon, was developed in the 1970s and 1980s by Pharmacia, and is approved for use in eye surgery (i.e., corneal transplantation, cataract surgery, glaucoma surgery, and surgery to repair retinal detachment). Other biomedical companies also produce brands of hyaluronan for ophthalmic surgery. Native hyaluronic acid has a relatively short half-life (shown in rabbits) so various manufacturing techniques have been deployed to extend the length of the chain and stabilise the molecule for its use in medical applications. The introduction of protein based cross-links, the introduction of free-radical scavenging molecules such as sorbitol, and minimal stabilisation of the HA chains through chemical agents such as NASHA (non-animal stabilised hyaluronic acid) are all techniques that have been used. In the late 1970s, intraocular lens implantation was often followed by severe corneal edema, due to endothelial cell damage during the surgery. It was evident that a viscous, clear, physiologic lubricant to prevent such scraping of the endothelial cells was needed. The name was changed to "hyaluronan" in 1986, because the polysaccharide synthesized by mammalian cells and certain species of microbes is a salt, not an acid. Since then, use of the name "hyaluronan" has become more prevalent. FDA approved formulations are available. In 2007, the EMA extended its approval of Hylan GF-20 as a treatment for ankle and shoulder osteoarthritis pain. Hyaluronan is used in treatment of articular disorders in horses, in particular those in competition or heavy work. It is indicated for carpal and fetlock joint dysfunctions, but not when joint sepsis or fracture are suspected. It is especially used for synovitis associated with equine osteoarthritis. It can be injected directly into an affected joint, or intravenously for less localized disorders. It may cause mild heating of the joint if directly injected, but this does not affect the clinical outcome. Intra-articularly administered medicine is fully metabolized in less than a week. Note that, according to Canadian regulation, hyaluronan in HY-50 preparation should not be administered to animals to be slaughtered for horse meat. In Europe, however, the same preparation is not considered to have any such effect, and edibility of the horse meat is not affected. Naked mole rats have very high molecular weight hyaluronan (6–12 MDa) that has been shown to give them resistance against cancer. This large HA is due to both differently sequenced HAS2 and lower HA degradation mechanisms. Due to its high biocompatibility and its common presence in the extracellular matrix of tissues, hyaluronan is gaining popularity as a biomaterial scaffold in tissue engineering research. In particular, a number of research groups have found hyaluronan's properties for tissue engineering and regenerative medicine are significantly improved with crosslinking, producing a hydrogel. This added feature allows a researcher to form a desired shape, as well as to deliver therapeutic molecules, into a host. Hyaluronan can be crosslinked by attaching thiols (trade names: Extracel, HyStem),methacrylates, hexadecylamides (trade name: Hymovis), and tyramines (trade name: Corgel). Hyaluronan can also be crosslinked directly with formaldehyde (trade name: Hylan-A) or with divinylsulfone (trade name: Hylan-B). Due to its ability to regulate angiogenesis by stimulating endothelial cells to proliferate, hyaluronan can be used to create hydrogels to study vascular morphogenesis. These hydrogels have properties similar to human soft tissue, but are also easily controlled and modified, making HA very suitable for tissue engineering studies. For example, HA hydrogels are appealing for engineering vasculature from endothelial progenitor cells by using appropriate growth factors such as VEGF and Ang-1 to promote proliferation and vascular network formation. Vacuole and lumen formation have been observed in these gels, followed by branching and sprouting through degradation of the hydrogel and finally complex network formation. The ability to generate vascular networks using HA hydrogels leads to opportunities for in vivo and clinical applications. One in vivo study, where HA hydrogels with endothelial colony forming cells were implanted into mice three days after hydrogel formation, saw evidence that the host and engineered vessels joined within 2 weeks of implantation, indicating viability and functionality of the engineered vasculature. ↑ Fraser JR, Laurent TC, Laurent UB (1997). "Hyaluronan: its nature, distribution, functions and turnover" (PDF). J. Intern. Med. 242 (1): 27–33. doi:10.1046/j.1365-2796.1997.00170.x. PMID 9260563. ↑ Stern, edited by Robert (2009). Hyaluronan in cancer biology (1st ed.). San Diego, CA: Academic Press/Elsevier. ISBN 978-0-12-374178-3. ↑ Stern R (2004). "Hyaluronan catabolism: a new metabolic pathway". Eur. J. Cell Biol. 83 (7): 317–25. doi:10.1078/0171-9335-00392. PMID 15503855. ↑ Sugahara K, Schwartz NB, Dorfman A (1979). "Biosynthesis of hyaluronic acid by Streptococcus" (PDF). J. Biol. Chem. 254 (14): 6252–6261. PMID 376529. ↑ Wessels MR, Moses AE, Goldberg JB, DiCesare TJ (1991). "Hyaluronic acid capsule is a virulence factor for mucoid group A streptococci" (PDF). Proc. Natl. Acad. Sci. U.S.A. 88 (19): 8317–8321. doi:10.1073/pnas.88.19.8317. PMC 52499 . PMID 1656437. ↑ Schrager HM, Rheinwald JG, Wessels MR (1996). "Hyaluronic acid capsule and the role of streptococcal entry into keratinocytes in invasive skin infection". J. Clin. Invest. 98 (9): 1954–1958. doi:10.1172/JCI118998. PMC 507637 . PMID 8903312. ↑ Toole BP (2000). "Hyaluronan is not just a goo!". J. Clin. Invest. 106 (3): 335–336. doi:10.1172/JCI10706. PMC 314333 . PMID 10930435. ↑ Holmes MW, et al. (1988). "Hyaluronic acid in human articular cartilage. Age-related changes in content and size". Biochem. J. 250 (2): 435–441. PMC 1148875 . PMID 3355532. ↑ Averbeck M, Gebhardt CA, Voigt S, Beilharz S, Anderegg U, Termeer CC, Sleeman JP, Simon JC (2007). "Differential regulation of hyaluronan metabolism in the epidermal and dermal compartments of human skin by UVB irradiation". J. Invest. Dermatol. 127 (3): 687–97. doi:10.1038/sj.jid.5700614. PMID 17082783. ↑ Abate, Michele; Salini, Vincenzo (2012). Hyaluronic Acid in the Treatment of Osteoarthritis: What is New, Osteoarthritis - Diagnosis, Treatment and Surgery, Prof. Qian Chen (Ed. ), (PDF). Italy: InTech. pp. 102–114. ISBN 978-953-51-0168-0. ↑ Josefsson A, Adamo H, Hammarsten P, Granfors T, Stattin P, Egevad L, Laurent AE, Wikström P, Bergh A (2011). "Prostate cancer increases hyaluronan in surrounding nonmalignant stroma, and this response is associated with tumor growth and an unfavorable outcome". Am. J. Pathol. 179 (4): 1961–1968. doi:10.1016/j.ajpath.2011.06.005. PMC 3181394 . PMID 21854754. ↑ Gritsenko PG, Ilina O, Friedl P (2012). "Interstitial guidance of cancer invasion". J. Pathol. 226 (2): 185–199. doi:10.1002/path.3031. PMID 22006671. ↑ Bharadwaj AG, Kovar JL, Loughman E, Elowsky C, Oakley GG, Simpson MA (2009). "Spontaneous metastasis of prostate cancer is promoted by excess hyaluronan synthesis and processing". Am. J. Pathol. 174 (3): 1027–36. doi:10.2353/ajpath.2009.080501. PMC 2665762 . PMID 19218337. ↑ Gao F, Yang CX, Mo W, Liu YW, He YQ (2008). "Hyaluronan oligosaccharides are potential stimulators to angiogenesis via RHAMM mediated signal pathway in wound healing". Clin Invest Med. 31 (3): E106–16. PMID 18544273. ↑ Gao F, Okunieff P, Han Z, Ding I, Wang L, Liu W, Zhang J, Yang S, Chen J, Underhill CB, Kim S, Zhang L (2005). "Hypoxia-induced alterations in hyaluronan and hyaluronidase". Adv. Exp. Med. Biol. 566: 249–56. doi:10.1007/0-387-26206-7_33. PMID 16594159. ↑ Ouhtit A, Abd Elmageed ZY, Abdraboh ME, Lioe TF, Raj MH (2007). "In vivo evidence for the role of CD44s in promoting breast cancer metastasis to the liver". Am. J. Pathol. 171 (6): 2033–9. doi:10.2353/ajpath.2007.070535. PMC 2111125 . PMID 17991717. ↑ Naor D, Wallach-Dayan SB, Zahalka MA, Sionov RV (2008). "Involvement of CD44, a molecule with a thousand faces, in cancer dissemination". Semin. Cancer Biol. 18 (4): 260–7. doi:10.1016/j.semcancer.2008.03.015. PMID 18467123. ↑ Hall CL, Turley EA (1995). "Hyaluronan: RHAMM mediated cell locomotion and signaling in tumorigenesis". J. Neurooncol. 26 (3): 221–9. doi:10.1007/bf01052625. PMID 8750188. ↑ Savani RC, et al. (2001). "Differential involvement of the hyaluronan (HA) receptors CD44 and receptor for HA-mediated motility in endothelial cell function and angiogenesis". J. Biol. Chem. 276 (39): 36770–36778. doi:10.1074/jbc.M102273200. PMID 11448954. ↑ Kennedy J. F., et al., HA, Volume 2 Biomedical, Medical and Clinical Aspects, 2002, Woodhead Publishing Limited. ↑ Kennndy J. F., et al., HA, Volume 2 Biomedical, Medical and Clinical Aspects, 2002, Woodhead Publishing Limited. ↑ Shu XZ, Ghosh K, Liu Y, Palumbo FS, Luo Y, Clark RA, Prestwich GD (2004). "Attachment and spreading of fibroblasts on an RGD peptide-modified injectable hyaluronan hydrogel". J Biomed Mater Res A. 68 (2): 365–75. doi:10.1002/jbm.a.20002. PMID 14704979. 1 2 3 4 5 6 7 8 9 10 11 12 13 14 15 16 17 18 19 20 21 22 Chen WY, Abatangelo G (1999). "Functions of hyaluronan in wound repair". Wound Repair Regen. 7 (2): 79–89. doi:10.1046/j.1524-475x.1999.00079.x. PMID 10231509. ↑ Wisniewski HG, Hua JC, Poppers DM, Naime D, Vilcek J, Cronstein BN (1996). "TNF/IL-1-inducible protein TSG-6 potentiates plasmin inhibition by inter-alpha-inhibitor and exerts a strong anti-inflammatory effect in vivo". J. Immunol. 156 (4): 1609–15. PMID 8568267. ↑ Mohamadzadeh M, DeGrendele H, Arizpe H, Estess P, Siegelman M (1998). "Proinflammatory stimuli regulate endothelial hyaluronan expression and CD44/HA-dependent primary adhesion". J. Clin. Invest. 101 (1): 97–108. doi:10.1172/JCI1604. PMC 508545 . PMID 9421471. ↑ Tammi R, Ripellino JA, Margolis RU, Tammi M (1988). "Localization of epidermal hyaluronic acid using the hyaluronate binding region of cartilage proteoglycan as a specific probe". J. Invest. Dermatol. 90 (3): 412–4. doi:10.1111/1523-1747.ep12456530. PMID 2450149. ↑ Foschi D, Castoldi L, Radaelli E, Abelli P, Calderini G, Rastrelli A, Mariscotti C, Marazzi M, Trabucchi E (1990). "Hyaluronic acid prevents oxygen free-radical damage to granulation tissue: a study in rats". Int J Tissue React. 12 (6): 333–9. PMID 1966392. ↑ Wisniewski HG, Vilcek J (1997). "TSG-6: an IL-1/TNF-inducible protein with anti-inflammatory activity". Cytokine Growth Factor Rev. 8 (2): 143–56. doi:10.1016/s1359-6101(97)00008-7. PMID 9244409. ↑ Hardwick C, Hoare K, Owens R, Hohn HP, Hook M, Moore D, Cripps V, Austen L, Nance DM, Turley EA (1992). "Molecular cloning of a novel hyaluronan receptor that mediates tumor cell motility". J. Cell Biol. 117 (6): 1343–50. doi:10.1083/jcb.117.6.1343. PMC 2289508 . PMID 1376732. ↑ Wang C, Thor AD, Moore DH, Zhao Y, Kerschmann R, Stern R, Watson PH, Turley EA (1998). "The overexpression of RHAMM, a hyaluronan-binding protein that regulates ras signaling, correlates with overexpression of mitogen-activated protein kinase and is a significant parameter in breast cancer progression". Clin. Cancer Res. 4 (3): 567–76. PMID 9533523. ↑ Hall CL, Lange LA, Prober DA, Zhang S, Turley EA (1996). "pp60(c-src) is required for cell locomotion regulated by the hyaluronanreceptor RHAMM". Oncogene. 13 (10): 2213–24. PMID 8950989. ↑ Morriss-Kay GM, Tuckett F, Solursh M (1986). "The effects of Streptomyces hyaluronidase on tissue organization and cell cycle time in rat embryos". J Embryol Exp Morphol. 98: 59–70. PMID 3655652. ↑ Ellis IR, Schor SL (1996). "Differential effects of TGF-beta1 on hyaluronan synthesis by fetal and adult skin fibroblasts: implications for cell migration and wound healing". Exp. Cell Res. 228 (2): 326–33. doi:10.1006/excr.1996.0332. PMID 8912726. 1 2 Tammi R, Ripellino JA, Margolis RU, Maibach HI, Tammi M (1989). "Hyaluronate accumulation in human epidermis treated with retinoic acid in skin organ culture". J. Invest. Dermatol. 92 (3): 326–32. doi:10.1111/1523-1747.ep12277125. PMID 2465358. ↑ Tuhkanen AL, Tammi M, Pelttari A, Agren UM, Tammi R (1998). "Ultrastructural analysis of human epidermal CD44 reveals preferential distribution on plasma membrane domains facing the hyaluronan-rich matrix pouches". J. Histochem. Cytochem. 46 (2): 241–8. doi:10.1177/002215549804600213. PMID 9446831. 1 2 Kaya, G; Rodriguez, I; Jorcano, J L; Vassalli, P; Stamenkovic, I (1997). "Selective suppression of CD44 in keratinocytes of mice bearing an antisense CD44 transgene driven by a tissue-specific promoter disrupts hyaluronate metabolism in the skin and impairs keratinocyte proliferation.". Genes & Development. 11 (8): 996–1007. doi:10.1101/gad.11.8.996. ISSN 0890-9369. ↑ Longaker MT, Chiu ES, Adzick NS, Stern M, Harrison MR, Stern R (1991). "Studies in fetal wound healing. V. A prolonged presence of hyaluronic acid characterizes fetal wound fluid". Ann. Surg. 213 (4): 292–6. doi:10.1097/00000658-199104000-00003. PMC 1358347 . PMID 2009010. ↑ Rutjes AW, Jüni P, da Costa BR, Trelle S, Nüesch E, Reichenbach S (2012). "Viscosupplementation for osteoarthritis of the knee: a systematic review and meta-analysis". Ann. Intern. Med. 157 (3): 180–91. doi:10.7326/0003-4819-157-3-201208070-00473. PMID 22868835. ↑ "Hylira gel: Indications, Side Effects, Warnings". Drugs.com. ↑ Edwards, PC; Fantasia, JE (2007). "Review of long-term adverse effects associated with the use of chemically-modified animal and nonanimal source hyaluronic acid dermal fillers.". Clinical interventions in aging. 2 (4): 509–19. PMID 18225451. ↑ Meyer K, Hobby GL, Chaffee E, Dawson MH (1940). "THE HYDROLYSIS OF HYALURONIC ACID BY BACTERIAL ENZYMES". J. Exp. Med. 71 (2): 137–46. doi:10.1084/jem.71.2.137. PMC 2135078 . PMID 19870951. ↑ Saari H, Konttinen YT, Friman C, Sorsa T (1993). "Differential effects of reactive oxygen species on native synovial fluid and purified human umbilical cord hyaluronate". Inflammation. 17 (4): 403–15. doi:10.1007/bf00916581. PMID 8406685. ↑ Schwarz, K. (1973-05-01). "A bound form of silicon in glycosaminoglycans and polyuronides". Proceedings of the National Academy of Sciences of the United States of America. 70 (5): 1608–1612. doi:10.1073/pnas.70.5.1608. ISSN 0027-8424. PMC 433552 . PMID 4268099. ↑ Schulz T, Schumacher U, Prehm P (2007). "Hyaluronan export by the ABC transporter MRP5 and its modulation by intracellular cGMP". J. Biol. Chem. 282 (29): 20999–1004. doi:10.1074/jbc.M700915200. PMID 17540771. ↑ Kakizaki I, Kojima K, Takagaki K, Endo M, Kannagi R, Ito M, Maruo Y, Sato H, Yasuda T, et al. (2004). "A novel mechanism for the inhibition of hyaluronan biosynthesis by 4-methylumbelliferone". J. Biol. Chem. 279 (32): 33281–33289. doi:10.1074/jbc.M405918200. PMID 15190064. ↑ Yoshihara S, Kon A, Kudo D, Nakazawa H, Kakizaki I, Sasaki M, Endo M, Takagaki K (2005). "A hyaluronan synthase suppressor, 4-methylumbelliferone, inhibits liver metastasis of melanoma cells". FEBS Lett. 579 (12): 2722–6. doi:10.1016/j.febslet.2005.03.079. PMID 15862315. ↑ Smith, MM; Ghosh, P (1987). "The synthesis of hyaluronic acid by human synovial fibroblasts is influenced by the nature of the hyaluronate in the extracellular environment". Rheumatol Int. 7: 113–22. doi:10.1007/bf00270463. PMID 3671989. ↑ Matou-Nasri S, Gaffney J, Kumar S, Slevin M (2009). "Oligosaccharides of hyaluronan induce angiogenesis through distinct CD44 and RHAMM-mediated signalling pathways involving Cdc2 and gamma-adducin". Int. J. Oncol. 35 (4): 761–773. doi:10.3892/ijo_00000389. PMID 19724912. ↑ Yung S, Chan TM (2011). "Pathophysiology of the peritoneal membrane during peritoneal dialysis: the role of hyaluronan". J. Biomed. Biotechnol. 2011: 1–11. doi:10.1155/2011/180594. PMC 3238805 . PMID 22203782. ↑ Tesar BM, Jiang D, Liang J, Palmer SM, Noble PW, Goldstein DR (2006). "The role of hyaluronan degradation products as innate alloimmune agonists". Am. J. Transplant. 6 (11): 2622–2635. doi:10.1111/j.1600-6143.2006.01537.x. PMID 17049055. ↑ Aruffo A, Stamenkovic I, Melnick M, Underhill CB, Seed B (1990). "CD44 is the principal cell surface receptor for hyaluronate". Cell. 61 (7): 1303–13. doi:10.1016/0092-8674(90)90694-a. PMID 1694723. ↑ Laurent UB, Reed RK (1991). "Turnover of hyaluronan in the tissues". Advanced Drug Delivery Reviews. 7: 237–256. doi:10.1016/0169-409x(91)90004-v.
↑ Fraser JR, Kimpton WG, Laurent TC, Cahill RN, Vakakis N (1988). "Uptake and degradation of hyaluronan in lymphatic tissue". Biochem. J. 256 (1): 153–8. PMC 1135381 . PMID 3223897. ↑ Campbell P, Thompson JN, Fraser JR, Laurent TC, Pertoft H, Rodén L (1990). "N-acetylglucosamine-6-phosphate deacetylase in hepatocytes, Kupffer cells and sinusoidal endothelial cells from rat liver". Hepatology. 11 (2): 199–204. doi:10.1002/hep.1840110207. PMID 2307398. ↑ Brown TJ, Laurent UB, Fraser JR (1991). "Turnover of hyaluronan in synovial joints: elimination of labelled hyaluronan from the knee joint of the rabbit". Exp. Physiol. 76 (1): 125–134. doi:10.1113/expphysiol.1991.sp003474. PMID 2015069. ↑ Avantaggiato, A; Girardi, A; Palmieri, A; Pascali, M; Carinci, F (August 2015). "Bio-Revitalization: Effects of NASHA on Genes Involving Tissue Remodeling.". Aesthetic plastic surgery. 39 (4): 459–64. doi:10.1007/s00266-015-0514-8. PMID 26085225. ↑ An Introduction to Biomaterials, Second Edition (Editor: Jeffrey O. Hollinger) 2011. John H. Brekke, Gregory E. Rutkowski, Kipling Thacker, Chapter 19 Hyaluronan. ↑ "Hylan G-F 20 (Synvisc) approved by EMEA for pain due to ankle and shoulder OA". National Health Service. Retrieved 2007-07-09. ↑ HY-50 for veterinary use Archived June 7, 2011, at the Wayback Machine. ↑ Genitrix HY-50 Vet brochure Archived June 1, 2008, at the Wayback Machine. ↑ Tian X, Azpurua J, Hine C, Vaidya A, Myakishev-Rempel M, Ablaeva J, Mao Z, Nevo E, Gorbunova V, Seluanov A (2013). "High-molecular-mass hyaluronan mediates the cancer resistance of the naked mole rat". Nature. 499 (7458): 346–9. doi:10.1038/nature12234. PMC 3720720 . PMID 23783513. ↑ Segura T, Anderson BC, Chung PH, Webber RE, Shull KR, Shea LD (2005). "Crosslinked hyaluronic acid hydrogels: a strategy to functionalize and pattern". Biomaterials. 26 (4): 359–71. doi:10.1016/j.biomaterials.2004.02.067. PMID 15275810. ↑ Segura T, Anderson BC, Chung PH, Webber RE, Shull KR, Shea LD (2005). "Crosslinked hyaluronic acid hydrogels: a strategy to functionalize and pattern" (PDF). Biomaterials. 26 (4): 359–71. doi:10.1016/j.biomaterials.2004.02.067. PMID 15275810. 1 2 Zheng Shu X, Liu Y, Palumbo FS, Luo Y, Prestwich GD (2004). "In situ crosslinkable hyaluronan hydrogels for tissue engineering". Biomaterials. 25 (7-8): 1339–48. doi:10.1016/j.biomaterials.2003.08.014. PMID 14643608. ↑ Gerecht S, Burdick JA, Ferreira LS, Townsend SA, Langer R, Vunjak-Novakovic G (2007). "Hyaluronic acid hydrogel for controlled self-renewal and differentiation of human embryonic stem cells". Proc. Natl. Acad. Sci. U.S.A. 104 (27): 11298–303. doi:10.1073/pnas.0703723104. PMC 2040893 . PMID 17581871. ↑ Smith MM, Russell AK, Schiavinato A, Little CB (2013). "A hexadecylamide derivative of hyaluronan (HYMOVIS®) has superior beneficial effects on human osteoarthritic chondrocytes and synoviocytes than unmodified hyaluronan". J Inflamm (Lond). 10: 26. doi:10.1186/1476-9255-10-26. PMC 3727958 . PMID 23889808. ↑ Dar A, Calabro A: Synthesis and characterization of tyramine-based hyaluronan hydrogels. J Mater Sci: Mater Med, 20:33–44, 2009. ↑ Genasetti A, Vigetti D, Viola M, Karousou E, Moretto P, Rizzi M, Bartolini B, Clerici M, Pallotti F, De Luca G, Passi A (2008). "Hyaluronan and human endothelial cell behavior". Connect. Tissue Res. 49 (3): 120–3. doi:10.1080/03008200802148462. PMID 18661325. ↑ Hanjaya-Putra D, Bose V, Shen YI, Yee J, Khetan S, Fox-Talbot K, Steenbergen C, Burdick JA, Gerecht S (2011). "Controlled activation of morphogenesis to generate a functional human microvasculature in a synthetic matrix". Blood. 118 (3): 804–15. doi:10.1182/blood-2010-12-327338. PMC 3142913 . PMID 21527523.